Download "In pursuit of these objectives, the flow of students between institutions will be governed as follows:"
2 The University of Western Ontario and its Affiliated University Colleges are committed to programs of study that will attract the most qualified students. In fact, the quality of our educational experience is dependent, in an important way, upon the abilities and motivations of our students. We agree that it is critical to maintain the high standards of admission that have been achieved in recent years and avoid substantial differences in these standards among our institutions in the future. Neither the Constituent University nor the Affiliated University Colleges will admit students to first-year study directly from the OSS system with final grades below 75%, unless detailed academic assessment deems this appropriate. Enrolment plans should also reflect Western s traditional commitment to students graduating from the Ontario Secondary School system. The percentage of students admitted each year directly into each of the Affiliated University Colleges from the OSS system2 should be in the range of 75%. 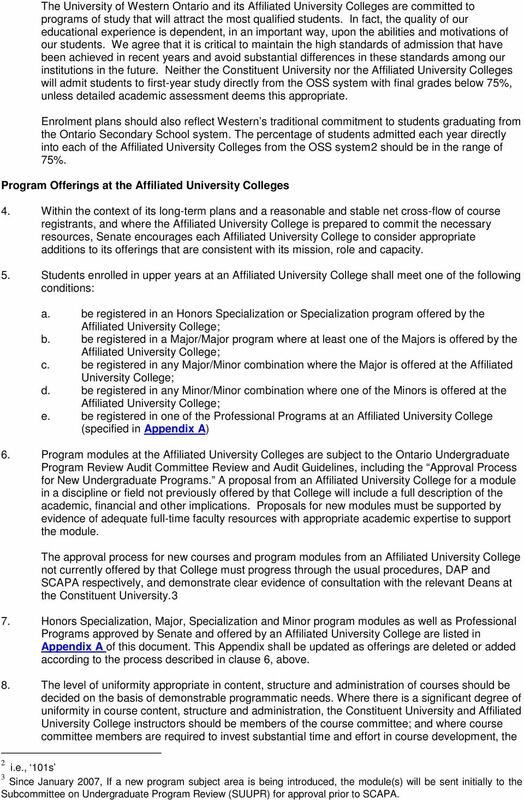 Program Offerings at the Affiliated University Colleges 4. 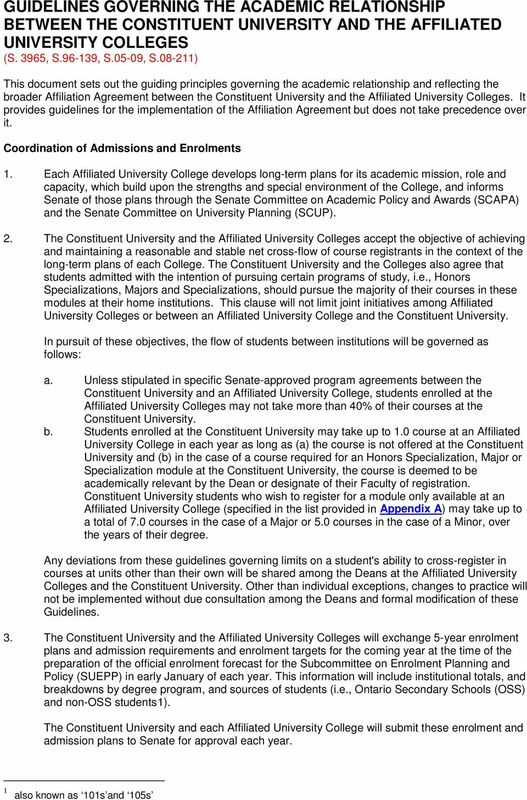 Within the context of its long-term plans and a reasonable and stable net cross-flow of course registrants, and where the Affiliated University College is prepared to commit the necessary resources, Senate encourages each Affiliated University College to consider appropriate additions to its offerings that are consistent with its mission, role and capacity. 5. Students enrolled in upper years at an Affiliated University College shall meet one of the following conditions: a. be registered in an Honors Specialization or Specialization program offered by the Affiliated University College; b. be registered in a Major/Major program where at least one of the Majors is offered by the Affiliated University College; c. be registered in any Major/Minor combination where the Major is offered at the Affiliated University College; d. be registered in any Minor/Minor combination where one of the Minors is offered at the Affiliated University College; e. be registered in one of the Professional Programs at an Affiliated University College (specified in Appendix A) 6. 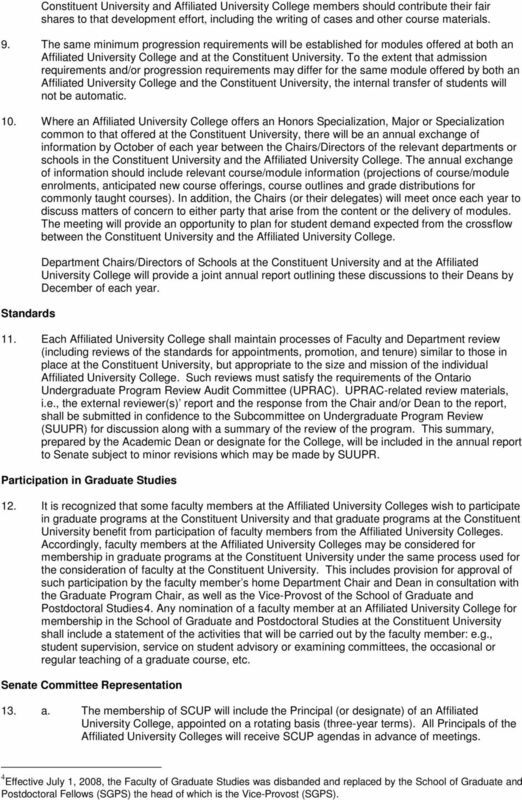 Program modules at the Affiliated University Colleges are subject to the Ontario Undergraduate Program Review Audit Committee Review and Audit Guidelines, including the Approval Process for New Undergraduate Programs. A proposal from an Affiliated University College for a module in a discipline or field not previously offered by that College will include a full description of the academic, financial and other implications. Proposals for new modules must be supported by evidence of adequate full-time faculty resources with appropriate academic expertise to support the module. The approval process for new courses and program modules from an Affiliated University College not currently offered by that College must progress through the usual procedures, DAP and SCAPA respectively, and demonstrate clear evidence of consultation with the relevant Deans at the Constituent University.3 7. 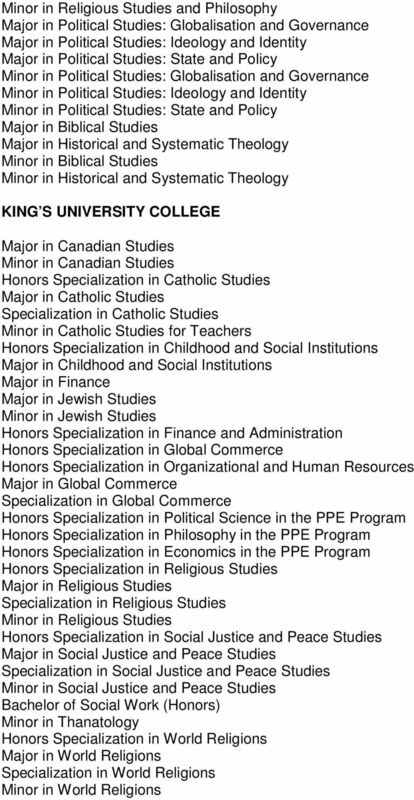 Honors Specialization, Major, Specialization and Minor program modules as well as Professional Programs approved by Senate and offered by an Affiliated University College are listed in Appendix A of this document. This Appendix shall be updated as offerings are deleted or added according to the process described in clause 6, above. 8. The level of uniformity appropriate in content, structure and administration of courses should be decided on the basis of demonstrable programmatic needs. Where there is a significant degree of uniformity in course content, structure and administration, the Constituent University and Affiliated University College instructors should be members of the course committee; and where course committee members are required to invest substantial time and effort in course development, the 2 i.e., 101s 3 Since January 2007, If a new program subject area is being introduced, the module(s) will be sent initially to the Subcommittee on Undergraduate Program Review (SUUPR) for approval prior to SCAPA. 3 Constituent University and Affiliated University College members should contribute their fair shares to that development effort, including the writing of cases and other course materials. 9. The same minimum progression requirements will be established for modules offered at both an Affiliated University College and at the Constituent University. To the extent that admission requirements and/or progression requirements may differ for the same module offered by both an Affiliated University College and the Constituent University, the internal transfer of students will not be automatic. 10. 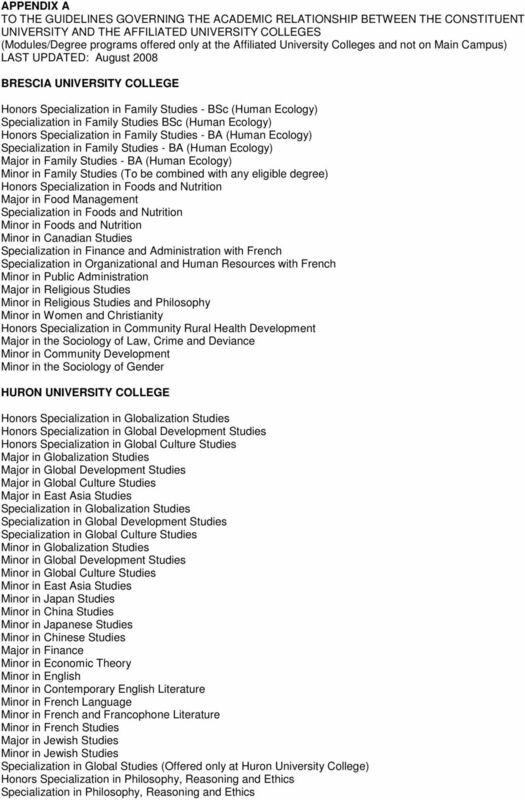 Where an Affiliated University College offers an Honors Specialization, Major or Specialization common to that offered at the Constituent University, there will be an annual exchange of information by October of each year between the Chairs/Directors of the relevant departments or schools in the Constituent University and the Affiliated University College. The annual exchange of information should include relevant course/module information (projections of course/module enrolments, anticipated new course offerings, course outlines and grade distributions for commonly taught courses). In addition, the Chairs (or their delegates) will meet once each year to discuss matters of concern to either party that arise from the content or the delivery of modules. The meeting will provide an opportunity to plan for student demand expected from the crossflow between the Constituent University and the Affiliated University College. Standards Department Chairs/Directors of Schools at the Constituent University and at the Affiliated University College will provide a joint annual report outlining these discussions to their Deans by December of each year. 11. Each Affiliated University College shall maintain processes of Faculty and Department review (including reviews of the standards for appointments, promotion, and tenure) similar to those in place at the Constituent University, but appropriate to the size and mission of the individual Affiliated University College. Such reviews must satisfy the requirements of the Ontario Undergraduate Program Review Audit Committee (UPRAC). UPRAC-related review materials, i.e., the external reviewer(s) report and the response from the Chair and/or Dean to the report, shall be submitted in confidence to the Subcommittee on Undergraduate Program Review (SUUPR) for discussion along with a summary of the review of the program. This summary, prepared by the Academic Dean or designate for the College, will be included in the annual report to Senate subject to minor revisions which may be made by SUUPR. Participation in Graduate Studies 12. It is recognized that some faculty members at the Affiliated University Colleges wish to participate in graduate programs at the Constituent University and that graduate programs at the Constituent University benefit from participation of faculty members from the Affiliated University Colleges. Accordingly, faculty members at the Affiliated University Colleges may be considered for membership in graduate programs at the Constituent University under the same process used for the consideration of faculty at the Constituent University. This includes provision for approval of such participation by the faculty member s home Department Chair and Dean in consultation with the Graduate Program Chair, as well as the Vice-Provost of the School of Graduate and Postdoctoral Studies4. Any nomination of a faculty member at an Affiliated University College for membership in the School of Graduate and Postdoctoral Studies at the Constituent University shall include a statement of the activities that will be carried out by the faculty member: e.g., student supervision, service on student advisory or examining committees, the occasional or regular teaching of a graduate course, etc. Senate Committee Representation 13. a. The membership of SCUP will include the Principal (or designate) of an Affiliated University College, appointed on a rotating basis (three-year terms). All Principals of the Affiliated University Colleges will receive SCUP agendas in advance of meetings. 4 Effective July 1, 2008, the Faculty of Graduate Studies was disbanded and replaced by the School of Graduate and Postdoctoral Fellows (SGPS) the head of which is the Vice-Provost (SGPS). Institutional Quality Assurance Process Joint Graduate Programs Carleton University and University of Ottawa April 19, 2012 Table of Contents Introduction. 2 1 Authorities. 4 2 Scope... 5 3 Definitions. The committee appointed by the Dean/Librarian to conduct the hiring process within the appropriate academic unit.